Only two more days left until the BIG day. I had such big plans this year, but due to recent events, was unable to do everything I had wanted to do in terms of fundraising. I am so grateful to our friends, family, and blog readers, who have gotten us to where we are in terms of money raised so far. Thank you all so VERY much! It's true! It's true! They finally let us out! 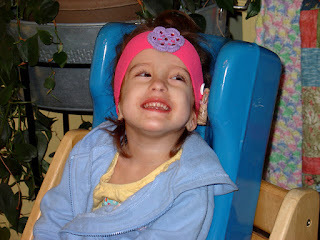 Everyone is feeling pretty great, and is so happy to be home, Eden most of all. She ate like a total pig all evening...like she couldn't get enough food. She had dinner twice. Spaghetti with meat sauce the first time, with four orange slices for desert, then fajita chicken with sour cream and guacamole a little over an hour later, and a WHOLE bag of Gripz chocolate chip cookies for desert (these are Eden's favorite snack EVER and the only thing she would eat while she was sick. Holland's staple is chips, Eden's is cookies). She couldn't shovel the food in fast enough. If she keeps this up for a week or so, she should gain back the weight in no time. She also drank 12 ounces of her 27cal formula today, which she had been refusing all week. That's almost back to normal. It was SO FUN to see how happy she was to be home. She was squealing and smiling all evening. 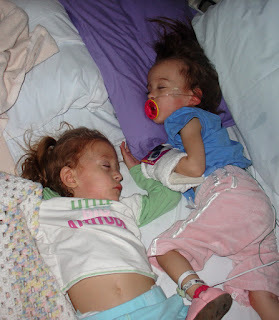 She fell asleep having a breathing treatment, and BOTH of my girls are now sleeping soundly in their OWN beds. So now I've gotta go. I'm going to go sleep in my OWN bed, with my hubby, for the first time in WEEKS!!! Eden had a pretty good day. 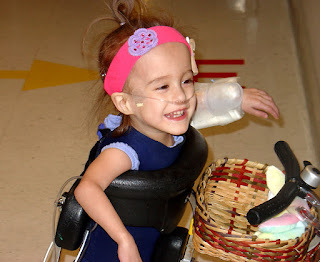 She was able to get up and around in her walker a little bit, and finally found her smile. It was sorely missed on the few days it was absent. She got many compliments from strangers. One person commented that she "smiles with her whole body." It's true, and something we've recognized since she was a tiny baby. I love that smile. Eden was much calmer and more content today, and she had a pretty good appetite...for her. Her oxygen sats are good when she is calm, but they drop into the 80s when she gets worked up, such as after she plays for a while in her walker. She spent a couple of hours last night, and a few hours today, off the oxygen, but she still needs it periodically. Regarding going home, the doctor today said the dreaded words "maybe tomorrow", but I think Tuesday would be a safer bet. 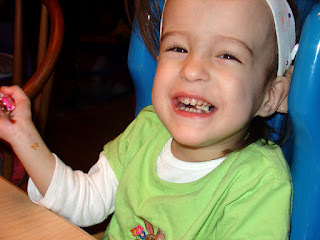 I've been amazed and dismayed to notice how much worse Eden's CP symptoms are when she is sick. She is a total rag doll in the trunk, and her legs are stiff as boards. I've actually never seen her legs as stiff as they are. Her left leg is especially bad, and is kind of rotating in. I'm really stressing out worrying about it pulling in her hip socket. We try stretching, but it is really difficult. It makes me realize that what I've always considered mild for Eden, may actually end up requiring intervention, like Botox and hip surgeries down the road. And with her trunk being so floppy, we also have to worry about scoliosis and possible spinal fusion in the future. I always try to take things a day at a time, but I guess I have to be prepared for the worse. 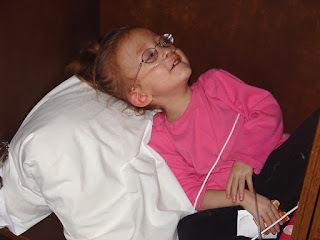 In addition to the CP issues, there has been talk of following up with an OT at the University Hospital for a swallow study, then maybe an overnight pH probe study from there, to look at her reflux and possible aspiration. The words "g-tube" and "nissen fundo" were mentioned, but that is still in the long term and depends on what the results of other studies show. 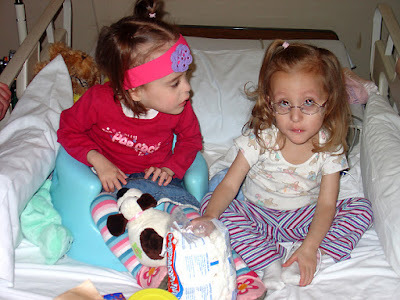 In addition to ALL of this, I also talked with the ENT who did Eden's cochlear implant sugery a couple of weeks ago, and her referred us to another ENT to look at Eden's tonsils and adenoids. 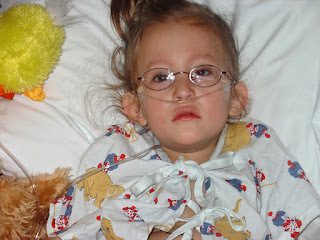 We're considering having them removed to help open her airway. She is really snorty when she eats, and we have wondered whether this might be contributing to her eating difficulties. She also snores. Where do you draw the line in all of this? How much intervention is TOO MUCH? How do you weigh the risks of the surgery, and the fact that it might not even work, against the benefits? I hate worrying about all of this all the time. I can't stand the thought of putting her through any more procedures and surgeries, but I know I won't be able to avoid it forever. Don't mind Mommy's hair in this pic and Eden's hair above. It's been a long week and we've bigger things to worry about! "I don't know why you say goodbye I say hello." So, Holland had a great night. Her sats dipped into the high 80's a couple of times while she was sleeping, but she recovered quickly and spent most of the night between 90 and 92. During the day she is back up around 96 and was officially discharged this morning! Poor Eden on the other hand, had a very rough night. I went home from the hospital last night to shower, leaving my mom and dad with Holland. When I got home, Eden was in a pretty rough state. She was moaning and whimpering, had a fever, and was doing a weird grunting thing when she was breathing. She hadn't eaten or drank anything since earlier that morning. I tried to give her Tylenol and she spit it all out, held her breath, and took several minutes to calm back down. She was coughing continuously, with a cough that sounded like she was dying. Seriously. So, we finally broke down and decided to take Eden to the ER. Upon arrival, she was satting 95, but as soon as she got the least bit upset or aggravated she began coughing and her sats dropped into the low 80s. She also showed moderate ketones in her urine, suggesting that she was dehydrated. With MUCH drama, they did a chest xray, and started an IV. The xray showed "extensive infiltration" on both sides, in other words, pneumonia. 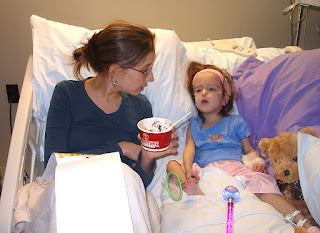 She was admitted, and we finally made it to her room, across the hall from Holland, at around 2am. John and I finally made it to bed sometime after 4. Today we put Eden on a nasal cannula for oxygen. She screamed and fought and tried repeatedly to pull it out. I had to hold her down. I am SO TIRED of holding my kids down so people can hurt them. I know it's necessary, but I still hate it. It goes against every fiber of my being. I want to cuddle them and comfort them and make them laugh. I don't want to hold them down so they can be hurt. I hate that part of being a mom. 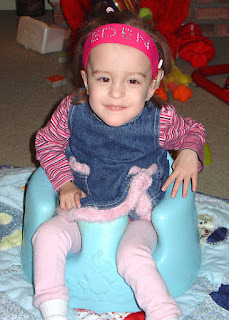 Even so, through it all, the WORST possible was the news we got when Eden was weighed yesterday. It brings me to tears to talk about it, and even just writing this I want to bawl. 17 pounds 11 ounces. That's at least two pounds lost. I can't believe it. I feel so defeated. It took us almost a year to gain those pounds. I don't know how many ways you can say the same thing... We're still here. We have had Holland on 1 liter of O2 for the past couple of days, trying to give her a little boost so she can work less on breathing and more on eating and getting better. 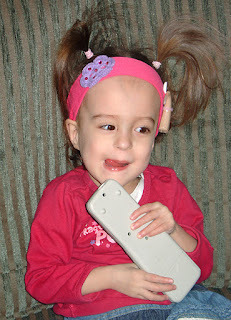 I don't know if it is working, or just the benefit of more time, but she is definitely feeling pretty good. We're going to try taking her off the O's at dinnertime today, to see if she can maintain tonight. If she does well, then maybe tomorrow...hahahahahaha. Yeah right. I'll try to post some recent pics of Eden next. I have the camera with me at the hospital so for now you get "The Holland Channel...All Holland, All the Time". (Those of you who watch Elmo's World over and over and over and over will appreciate that!) Gah! If I have to watch another episode of Sesame Street, Blues Clues, Barney, or The Wiggles I might go CRAZY! She'll look at me, and she'll smile, but she won't look at me and smile at the same time! So, it's a no go. I was right the first time. Maybe today, maybe tomorrow, maybe by the weekend, maybe in a week, maybe in two weeks. Someday, I guess, we'll go home. But for now, we're still here. Nothing has changed. I was explicitly told that "under NO circumstances" would Holland go home with oxygen. But I think it is being considered. I think there may be RSV, or something like it, somewhere around here, and they've decided it is too risky to keep her here. I hope, hope, hope! Get me out of here!!! It's becoming a familiar refrain..."maybe tomorrow." But after hearing it so many times, I just don't believe it anymore. I can tell you just from Holland's numbers so far today, that we won't be going home tomorrow. 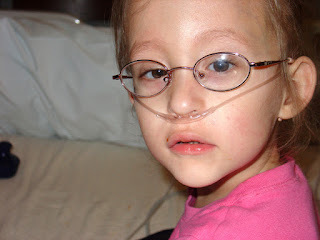 Her sat is hovering between 90-92 during the day with no oxygen cannula. It quickly drops to 86-89 when she is sleeping. Today she has a snotty nose, which she didn't have before. I know it could be the pneumonia working it's way out, but I'm afraid that she has picked up something else. The whole hospital wing is filled with coughing, snotty nosed kids. Holland is in NO WAY content to stay in her room. 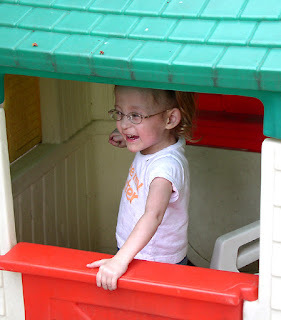 She wants to be out playing and touching everything in typical two-year-old fashion. She wants to play with the other kids. I can only do so much in keeping her sanitized and away from germs, but I am becoming more and more paranoid the longer we are here. I just don't want her picking up another bug! Eden saw the pediatrician on Saturday, and again this morning. She is pretty miserable. 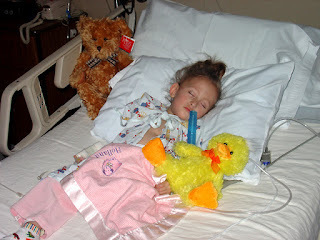 She has an ear infection, some pneumonia, and reactive airway (wheezing, bronchial inflamation). 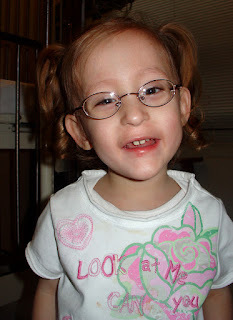 She has been on antibiotics and Albuterol treatments every 3-5 hours for 4 days, and today was prescribed an oral steroid. Her oxygen saturation was 97 in the office, so no hospitalization needed for now. The doctor wants her seen again before the weekend because she has been eating and drinking next to nothing and is at risk for dehydration. If anything, that is what she'll end up in the hospital for. I feel so down and discouraged. Both girls have had such a huge setback. I feel like we've lost at least 6 months of progress in eating, gaining weight, and motor skills, as well as any sense of "normalcy" that we might have been feeling for the past couple of months. It's been a big wake up, reminder, kick in the pants, that Holland and Eden will never outgrow the effects of their extreme prematurity. With all of the recent commotion in our lives, we haven't been able to adequately focus on our fundraising efforts. 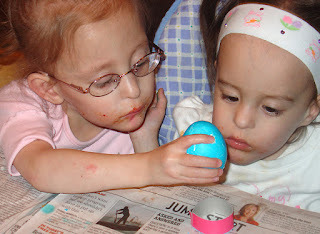 John and I still plan on walking for the March of Dimes WalkAmerica next weekend, even if we have to do it without our sweeties. If nothing else, this recent bout of illness and the setbacks that have come along with it, are a reminder of what an important cause this is. 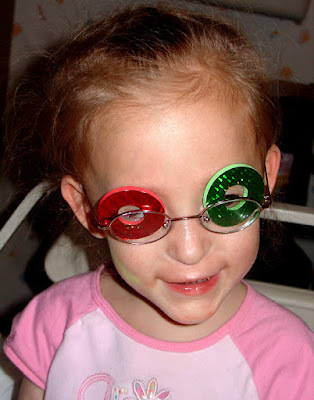 Please show your support for Team Holland and Eden by helping us to reach our goal! We're still here... We had one doctor today tell us that Holland might go home tomorrow, and another tell us Tuesday. I'm guessing more like Tuesday...maybe Wednesday. Holly has been able to go pretty much all day without oxygen, but needs just a whiff when she is sleeping. Interestingly, I asked one of the docs under what circumstances they would send her home with O2 at night. His response was "under no circumstances." So, if all she needs is a whiff of O2 at night for the next year, I guess we'll be living here. 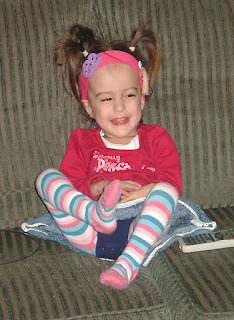 Holland still has a bit of a cough, that gets worked up if she is very active or upset, but overall she is happy, energetic, and entertaining. John and I traded off last night, and I stayed the night at home with Eden. 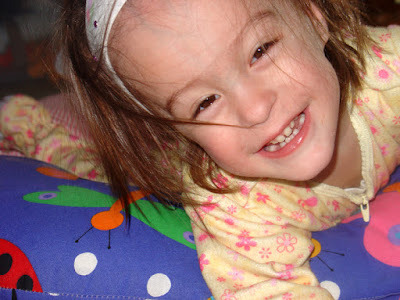 After two terrible nasty sick days, she had a pretty good night, and was in a sweet mood for most of this morning. I brought her to the hospital to visit with her sis for a couple of hours, and that was really fun until they both started to melt down at the same time. 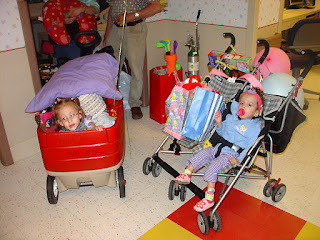 Then Daddy had to whisk Eden away to take her home for another treatment and Tylenol. Now they are both sleeping. Meanwhile, Daddy and I are both exhausted, physically and emotionally. We haven't slept in the same bed for 7 nights, and haven't had conversation that didn't revolve around our children's health in just as long. Our taxes aren't done and we don't know what to do about it... There are bills to be paid. The laundry and dishes and and basic maintenance of the house has piled up. I am supposed to go to work on Tuesday. I have kids to test, and IEP's waiting. Parents and teachers are getting frustrated because they have to keep changing meetings because of me and I feel bad. It's going to take a couple of weeks for us to get things sorted out, and to get our lives back to some semblance of normal. But first, we have to get out of the hospital!!! The good: Following two really terrible, worrisome days, Holland is finally showing signs of improvement. She actually got up and played today, and was smiling and talking a mile a minute. She also drank a good 20 ounces of formula, which is the most she has had in weeks. She is still rejecting all food except chips. Today I brought her some Doritos and she enjoyed them immensely. She had a tea party in the playroom, played balloon baseball with Aunt Kimi, and jumped on the bed. Definitely an improvement from yesterday when I could barely get her to sit up in bed. 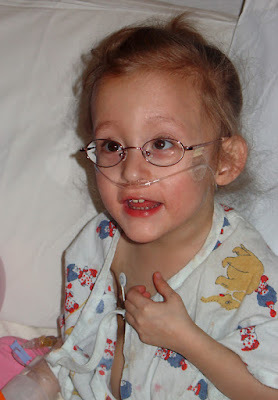 Yesterday they had bumped her up to 3 liters of oxygen. Today we were able to get down to 1.5. She is currently satting 98 on 1.5! That's good. She had another x-ray last night, which showed that her left lung was slightly compressed, so today we have done lots of percussion (pounding on her back and chest) to help loosen things up, and she has done a lot more good productive coughing. I think we are on an upswing with her. The bad: Eden is extremely sick. She has a fever, severe congestion, and a terrible sounding cough. I am sick again too. My theory is that Holland actually ended up catching a second virus while in the hospital last week. So she got better, but was sick again before the pneumonia cleared up completely, which is why she got so knocked out by the second sickness. Now Eden and I have both caught the nasty hospital virus. Just my theory, but I think it holds water. I plan to call the peed in the morning to see if we can get Eden in right away. Hopefully she and daddy get a good night's rest tonight at home. The ugly: Are you crazy? There's no ugly around here! Well, Holland's sleeping so I am finding myself with some time on my hands. I thought about taking a nap, but it is IMPOSSIBLE in this crazy place, so I decided to drink a big cup of vanilla cappuccino and do a post about Eden. I miss her. Just look at these pictures. That kid is so darn cool. Anyway, I am sure many of you remember the post I wrote about equipment. It seems like there is a lot out there, but none of it is just right for Edie. After much pondering, and trying out a lot of different ideas, we have found a good solution for Eden to sit at the dinner table with us. You all were right when you said that the Tripp Trapp chair probably wouldn't have enough trunk support for Eden. My good friend Heather, mom to Marley, bought a similar chair and found that it wouldn't work for Marley, so loaned it to us to try out. By itself it doesn't work at all, but strap this Tumbleforms feeder seat to it, and it is perfect. It brings Eden right up to the table, with enough support for her to be able to practice self-feeding, without flopping over. It also has a place for her to put her feet, though we may have to put some straps on it to hold them in place. 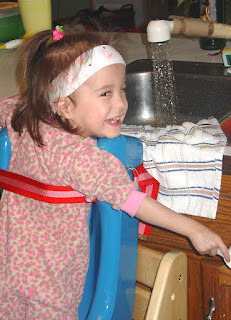 It also works great for her to kneel over the back to help wash dishes and play in the water, one of her very favorite things. In fact, I wonder if this solution might work for Miss Marley too??? We did try the Bumbo at the table, like several people suggested, but Eden still has to work to hold herself up in it, and it was too much when she was trying to eat at the same time. And just while I am talking about equipment... I got a call from the Medical Equipment supplier and they say my insurance won't cover the pony walker. I called the insurance company AGAIN, and they say they don't know why not. Hmmmm. Maybe I am not asking the right questions. I was going to sort it out this week, but here I am sitting at the hospital. I wonder if they just give everyone the run around, hoping that you'll give up and buy it yourself with credit on ebay??? We've GOT TO HAVE the pony walker. Eden would be so upset to see it go. She is already very attached to it. In fact, last week (or was it the week before?) when she was sick, I brought her to bed with me, and she was talking IN HER SLEEP saying "walka, walka, walka." She has a one track mind. It really is super cute...until you're trying to do PT with her and she won't let you put her down, and she arches her back and stiffens up and wails "walka, walka, walka!!!" Holland had a rocky Easter Sunday. We could tell that she wasn't feeling great all day. She took a long nap during the afternoon, and when she woke up she was coughing constantly, and seemed much more lethargic and out of it than usual. She barely ate anything all day, and wasn't drinking all of her normal bottles. She ended up going to bed okay, but awoke in the night coughing, and never really got to sleep again. 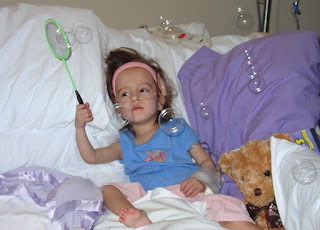 We brought her to our bed and gave her treatments about every 2 hours. I called the doctor's office, and took her in on Monday afternoon. At the pediatrician's office she was satting between 88-92. We did a treatment at the office, but it didn't help at all, and she stayed around 92, so the doctor sent us to the ER for another chest xray. When we got to the ER she was satting 83, and only came up to about 90 following three treatments in a row, so they decided to admit her AGAIN. 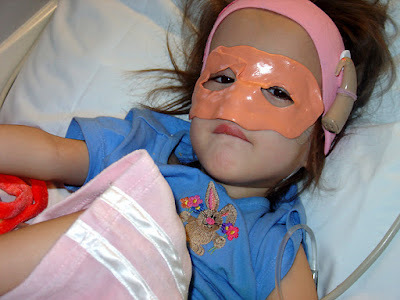 Initially, like last week, Holland refused to wear a nasal cannula, so we were trying to give her blow by O2, and occasionally she would wear a mask while watching a video. This week, Holland's sats are not staying up, even when she is awake. When we take the O2 away, she drops to between 88-92 right away. When she is sleeping, it goes even lower into the 80s. The first night John and I took shifts staying awake with her to blow the O2 on her face. 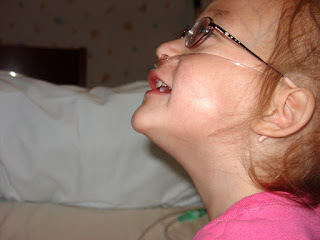 Finally yesterday evening, she was in a decent enough mood to try the cannula again, and she has been wearing it since. This makes it a lot easier for us to get a little more rest. Now I am able to sleep slightly better knowing that her O2 will stay on her face. Yesterday, I thought today would be a better day. Unfortunately, Holland had a pretty rough day. She was VERY tired and lethargic, and only spent a few hours awake. Her face has been very flushed and sweaty. 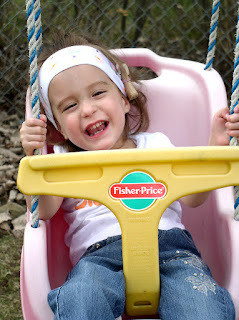 She has been as ornery as can be, and doesn't want anyone to touch her except for me, and maybe her dad. She cries when people enter the room, and tries to hit anyone who touches her. Today it seemed like she didn't even have the energy to be as mean as she wants to be. She didn't even want to play in the "hallway." We have been watching videos nonstop. In response to my fears, the doctor came in to see her again this evening, and increased her breathing treatments from every 4-6 hours, to every 2. We'll see if that makes any difference. My intuition is telling me that something is not right. I have been solid and calm for the past few days, but the stress and lack of sleep is starting to get to me. I took a break this evening when John got home from work, and cried the whole way to my mom's house. I had a dream last night that Holland had to be put on a vent. I know logically that this probably WON'T happen, but it is a big fear looming in my overactive imagination. I don't think I can handle it if that happens. I don't even know how I possibly survived 110 days in the NICU, but now feel like I am near my breaking point. This is nothing compared to that. But still. Haven't we been through enough? Will it ever end? I feel bad for Eden. I know she is in GREAT hands with my mom and dad, but I worry that she feels like we abandoned her. When I stopped to check in on her this evening she was happy, had eaten great all day, and was zooming around the kitchen in her walker. I don't know why I feel so bad about leaving her. I guess I miss her. And I worry that she misses me, and her sis. The doctor today said we'll be at the hospital for at least another 48 hours. That would put us out on Friday. I seriously doubt it. The way things look right now, I can't imagine being home before next Wednesday. Who knows though. I guess today could have been her bad day, and tomorrow she'll turn the corner. Stranger things have happened. We've made it this far, haven't we? Sorry if this post seems overly negative. It probably isn't as bad as I make it sound. Watch, they'll discharge her on Friday, and you all will think I am a neurotic mess! 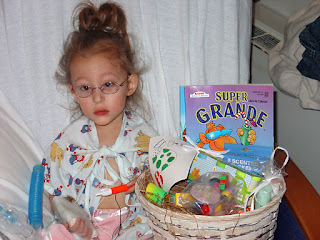 But hey, any of you who have spent more than a night or two in the hospital with a very sick kid know how I feel... It's not much fun. I'm stressed. Sick and tired of being sick and tired. To say that Holland and Eden like bubbles would be a HUGE understatement. You know, I joined a "Micropreemie Blog Moms" Group a while back, and have found it to be really interesting, useful, helpful, and supportive forum. I feel like I have gotten to know some of the group members pretty well, and have found them to be quite wonderful in responding to me when I need someone to vent my frustrations to, as well as to ask questions related to having preemies. 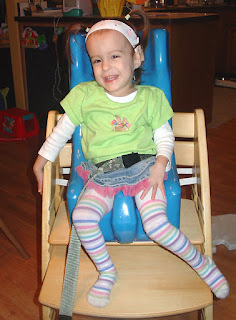 Occasionally, someone will post a question related to having a child with a disability, such as what are the signs/symptoms of CP, what is a good pediatric stander, etc. Sometimes there are questions I feel qualified to respond to, and sometimes not. 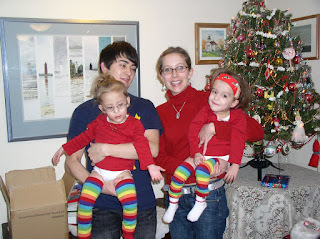 Recently through this blog, I have "met" a few other moms of children with CP, and have gotten to like them quite well! Collectively I think we have a lot of questions, as well as a lot of answers and ideas that we can share with one another. 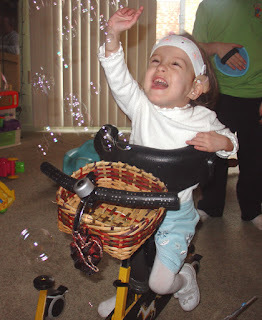 So, I think I would like to start a "Cerebral Palsy Moms" Group where we can keep in touch and connect with one another on another level. I think this could be a valuable resource for us to share ideas and experiences, and to learn from and help one another. 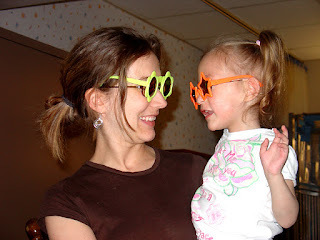 It would also be a great way for newer moms of children with CP to find some support. What do you think? Jacqui? Kathryn? Heather? Angela? Anyone else? 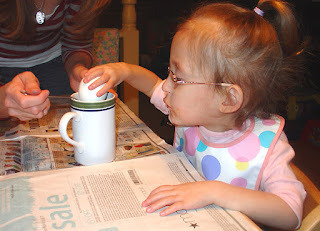 Would those of you parenting children with CP be interested in joining such a group? 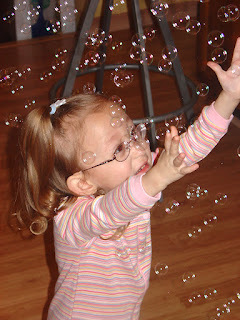 This is the bubble QUEEN! 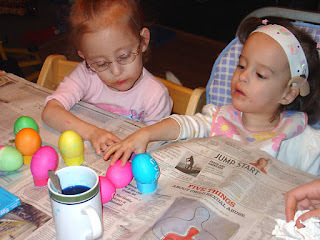 We had a lot of fun coloring Easter eggs with the girls this year. Only about half of them ended up broken! 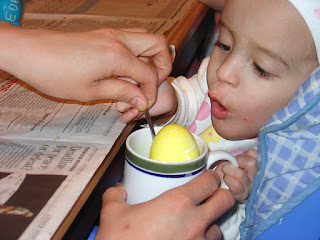 Eden was especially interested in the process, and ooohed and aaahed over every egg. Poor Holly is still having a hard time fighting this recent bug. I took her to the pediatrician on Thursday. 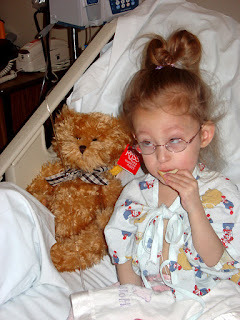 While we were there, she didn't cough once, and her sats were at 97%, so she was declared well. We came home and that afternoon she took a five hour nap. 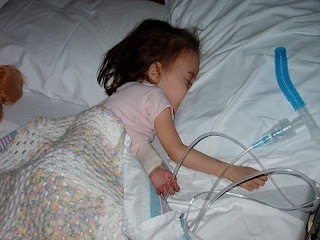 When she woke up her fever was back, and she started coughing again. Each night since she has woken several times in the night coughing, and we are doing breathing treatments about every four hours. She had a fever all day Friday, and part of yesterday, as well as this morning. In between coughing fits she seems okay. She doesn't really seem to be wheezing as much, and she isn't as crabby. But once the coughing starts she becomes a mess. I wish she would get better. I feel really bad for her. Yesterday we went to my Grandma's for our annual family Easter dinner. We really debated as to whether or not to go, with Holland still sick, but everyone really wanted to see the girls, so we went. 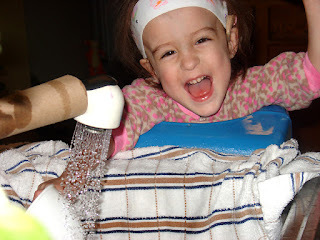 We had a lot of fun, cause no matter how sick she is, Holly always perks up for a party. Eden was a blast in her walker flying through my Grandma's house. It was nice for my extended family to have a chance to see her mobile. 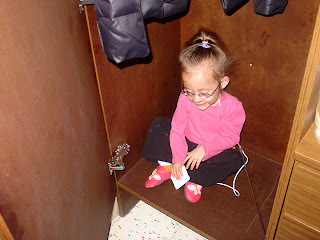 She was so funny laughing and trying to get into everything. She also LOVED my Grandma's mac and cheese. Since she has been feeling better, for maybe the last three or four days, she has been eating REALLY well. 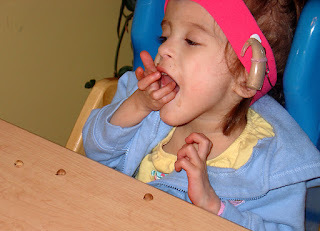 She was diving at the dinner table yesterday, signing and saying "eat." She sat in her chair for over a half hour chowing down on ham, mac and cheese, green beans, and spaghetti salad. Then she had some banana pudding for desert. I think she may have eaten more Easter dinner than my nephew Malachi (who by the way, weighed 32 pounds at his 18-month checkup!). Unfortunately, the party was cut short by another of Holly's coughing fits, and we had to leave to give her a treatment. Poor Holland. 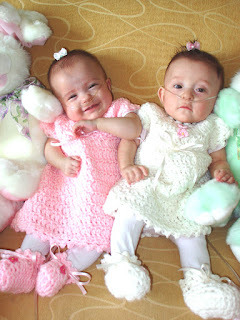 Finally, just for fun I thought I'd do a flashback picture from Holland and Eden's first Easter. I absolutely adore this photo. I miss my squishy little babies! They have gotten so big! And so opinionated! We are home! It's late, and I don't have time for a long update since I haven't really slept for three straight nights, but I wanted to let everyone know that Holly is doing well. I'll have to take her in to the peed and pulmonologist this week to have her checked out, but she did a decent job of keeping her sats up during the night...well, at least during the four or five hours that she actually slept, so they let us come home. The good news is that she went to bed tonight in her OWN bed, with relatively little fussing, and is still sleeping soundly two hours later:) There will be no strange people coming in multiple times during the night to mess with her and wake her up, and boy, do I know she is happy about that! I know I am! Thank you all for your kind thoughts and prayers for Holland. The kindness and support we have received through this blog is inspiring to my family, and gets us through the rough patches. PS. I haven't had much time to take pictures over the past couple of days, so I dropped in one that I recently found on my dad's camera...enjoy! Just wanted to do a quick update, and let you all know that Holland was admitted to the hospital yesterday afternoon with viral pneumonia and reactive airway. We had a miserable night trying to manage it at home on Sunday, so I took her in to the ER Monday morning. She is doing much better with her steroids, antibiotic, and breathing treatments ever three hours. 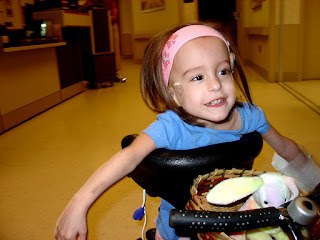 We thought we'd bring her home today, because she is holding her sats up with no oxygen, and acting like her totally fine, happy, stubborn, playful self. 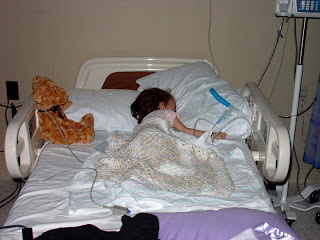 The problem is that during her nap her oxygen fell into the high 80s so they want to keep her at least one more night. Will keep you posted!